For home buyers in Port Aransas , the survey may be signaling higher new home prices ahead; when builders are more confident in housing, they’re may be less likely to make concessions in price, and to “sweeten” deals with free upgrades and/or subsidized mortgage rates. 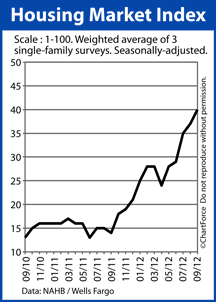 If you’re planning to buy new construction in TX later this year or into early-2013, consider moving up your time frame. Homes may be for sale, but they won’t likely be as inexpensive as they are today.